Perhaps you’ve heard a lot of people are using CBD. The chemical compound, naturally occurring in cannabis plants, doesn’t get you high, but does have a wide swath of other purported effects making it very popular. Although clinical studies haven’t necessarily proven those results, many Americans are testing CBD (which stands for “cannabidiol”) for themselves. All over the US, people are rubbing CBD balm onto aching joints, dropping CBD tinctures under tired tongues, popping CBD gummies, and puffing on CBD oil-filled vaporizers in hopes of chilling out. On Quartz’s behalf, Harris Poll recently surveyed more than 2,000 people in the US about their experience, knowledge, and opinions regarding CBD and found that more than 85% of Americans have heard of CBD, and of those, more than one in five have tried it. What are all these people using CBD for? 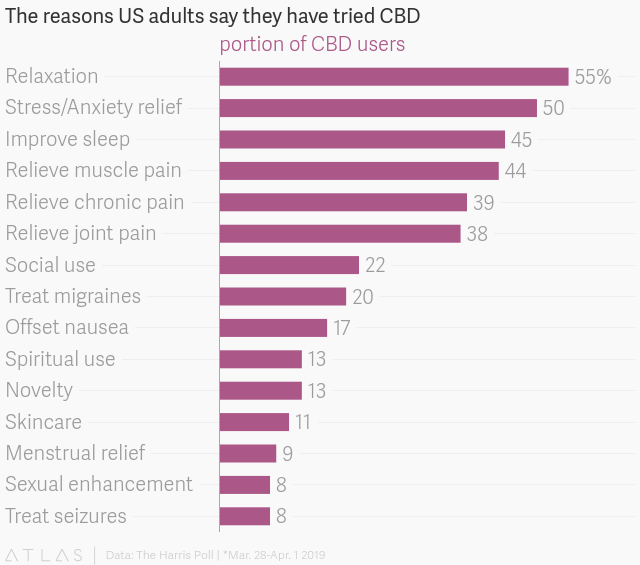 More than half of the CBD-users surveyed—some 55%—said they use it to relax. Half reported using it to reduce stress and anxiety, and the proportions of people who use CBD to improve their sleep and relieve pain (including muscle, chronic, and joint pain) were not far behind. Also on the list were relief from migraines, menstrual symptoms, nausea, and sexual enhancement. Is there proof that CBD works for all this? So what do we know about these popular uses for CBD? Could CBD help relieve my anxiety and stress? Are you a rat or a mouse? If so, chances are good that CBD administered in moderate doses—10 mg/kg is too low; 100 mg/kg is too high—could have an anti-anxiety effect, particularly if you’re feeling anxious because you’ve been placed in a maze or are panicking because a snake has been introduced to your environment. But as Cooper notes, “to understand cannabidiol’s effect on anxiety, you want to test it in a population that has anxiety, and look at what happens when they’re using cannabidiol every day for a couple of weeks.” In this study, each subject only got a single dose. Could CBD help me sleep? More recently, 409 people with insomnia participated in a 2018 study in which they self-reported the effects of cannabis on their quality of sleep. For more than 1,000 total sessions, they used an app to record the severity of their symptoms before and after using cannabis, as well as their method of consumption and the cannabinoid content. (Again, 400 insomniacs smoking and vaping cannabis at home and self-reporting results via an app would not pass muster as a “rigorous, double-blind placebo-controlled” study, but it’s what we’ve got.) This study didn’t focus on CBD without the presence of THC, but it did find those who used strains with higher potencies of CBD were likelier to experience relief from their symptoms, and less likely to have adverse side effects. Could CBD ease my pain? In rats, studies have shown that CBD helps to alleviate various sorts of pain, when administered both orally and topically—popular ways for humans to medicate with CBD, via tinctures, edibles, and topicals. In one cringe-inducing study, scientists evaluated rats’ sensitivity to pain by exposing their sciatic nerves with an incision, constricting those nerves with tiny threads, or injecting their paws with bacteria to induce inflammation. Then, they fed them CBD or a placebo every day for a week, and measured how quickly the critters withdrew their legs when exposed to heat or pressure, compared to how they reacted before their respective surgeries or injections. Another study looked at how CBD gel affects rats induced with arthritic knee joints, and showed that it reduced swelling and pain. In humans, Cooper emphasized that oft-cited studies regarding CBD’s pain-relieving properties looked at it in combination with THC. For example, one 2010 study of 177 patients suffering from cancer-related pain found an extract containing CBD and THC to be about twice as likely to provide relief as an extract of THC alone. Could CBD help me chill out? Perhaps, and that’s what most current CBD users—some 55%—are hoping. It stands to reason that the aforementioned possible reductions of stress, anxiety, and pain, combined with improved sleep, might help a person to unwind. Ditto for easing many menstrual symptoms. Studies on lab animals suggest CBD could also act as an antidepressant. For example, in a 2010 study, scientists in Brazil injected mice with one of three doses of CBD, an antidepressant called imipramine (an uncommonly prescribed drug sold under the brand name Tofranil), or a placebo. Then, they dropped the mice into glass cylinders of water, forcing them to swim for their lives for six minutes. This procedure, commonly used to evaluate antidepressants, is sometimes called the “behavioral despair test,” the idea being that scientists measure how long the mouse will swim before giving up in despair. Lo and behold, the mice injected with the medium dose of CBD and the imipramine persevered for significantly longer than their compatriots given a low-dose, high-dose, and placebo. Could CBD help my migraine? In 2018 Stephen Silberstein, director of the Headache Center at Jefferson University Hospital in Philadelphia, told the American Headache Society there were no studies of cannabis or CBD as migraine treatments, and none were underway. That said, Silberstein has called it “perfectly reasonable” for migraine sufferers to use CBD to counteract migraine-related neck pain and even vomiting and nausea. Oh yeah, nausea. Could CBD help that? It could if it’s mixed with THC. A small human study showed that nabiximols (brand name Sativex) an oral spray which contains an approximately 1:1 ratio of THC:CBD and is prescribed outside the US for muscle spasticity caused by multiple sclerosis, also helped to reduce chemotherapy-induced nausea and vomiting. But as for CBD alone, I am so sorry to tell you we are back to the rodents. Rats, you may be relieved to learn, are incapable of vomiting. But Asian musk shrews can, and a relatively low dose of CBD (5 mg/kg) was shown to suppress the reflex. It also kept rats—who can’t seem to get a break—from retching. Could CBD reduce my child’s seizures? Yeah, actually. It’s entirely possible that it could. In November 2018, the US Food and Drug Administration approved Epidiolex, a liquid form of CBD, for use in reducing seizures caused by two potentially fatal forms of severe childhood epilepsy, Lennox-Gastaut syndrome and Dravet syndrome. Evelyn Nussenbaum, the mother of the first patient to receive Epidiolex, remembered reading a study about treating seizures with CBD in (you guessed it) rats in 2011, and thinking, “My son needs access to that.” Her son Sam became part of a one-person trial at the University of California-San Francisco. His seizures were drastically reduced without side effects, and in 2015, the doctor overseeing his care co-authored a study of 214 patients with severe childhood-onset epilepsy that showed a 36.5% median decrease in seizures over a 12-week treatment period with oral CBD. For Epidiolex’s manufacturer GW Pharmaceuticals to receive FDA approval for the drug, clinical trials were imperative. In one such double-blind, placebo-controlled study involving 120 participants, CBD reduced the number of seizures by about half in 40% of patients—and eliminated them completely in three cases. While Epidiolex is approved specifically for treating two forms of childhood epilepsy, Orrin Devinsky, the director of the Comprehensive Epilepsy Center at NYU Langone Health and the lead investigator of two clinical trials of the drug, told CNN he believed there’s a good chance it will be prescribed for “off-label” use. This practice of doctors prescribing drugs to treat conditions for which it is not officially approved is legal and common, according to the US Department of Health and Human Services. All of this shows a major shift in the way mainstream medical professionals—and consumers—have thought about cannabis and CBD.